Anyone have one of these? I do and I love it. Yesterday, there was a tornadic storm near Denton. I live in north Fort Worth, so I was just within the 30 mile range that it claims and wouldn't you know, it actually beeped, flashed, and said "Tornado Possible". I was thrilled after I had purchased this product from the Home Depot for about 40 dollars and was skeptical of the technology. Not skeptical any longer and looking forward to seeing how it works with lightning, and maybe even closer storms. Highly recommend this product as it detects lightning and tornadoes. Honestly it was warning me to tornado activity 15-20 minutes before a warning was issued by the NEW. Home depot has it for much cheaper. I was skeptical as well and could not find anything on the internet about it other than their own page. So I splurged and spent the 40 and it worked very well on a tornado event. I read that that lightning activity can lead to tornado formation but I didn't know it is now a "proven cause of tornado formation". That's a big difference. I would like to see the track record of this unit in regards to actual velocity data. If this can predict tornado's 100% then that is a huge game changer. Guess I have to do some more reading on this. There was a thread on this a few months ago, but apparently removed. Frankly, I think it's nothing more than a gimmick that may do some good, but I sure as hell wouldn't bet my life on it. If this "proven" technology is actually available to the general public, don't ya think the NWS, WMO, ect. would have employed it long ago? Seriously, technology of this magnitude would have made WORLD news. You might want to read this AMS paper before getting too excited about this device. The correlation between tornadoes and RF noise is somewhat weak and dependent on circumstances. Yes, it is an old paper, but the physical processes are still the same and the basic methodology seems valid. I don't mean to be rude to either of you, but I want to know how it worked so well the other day. 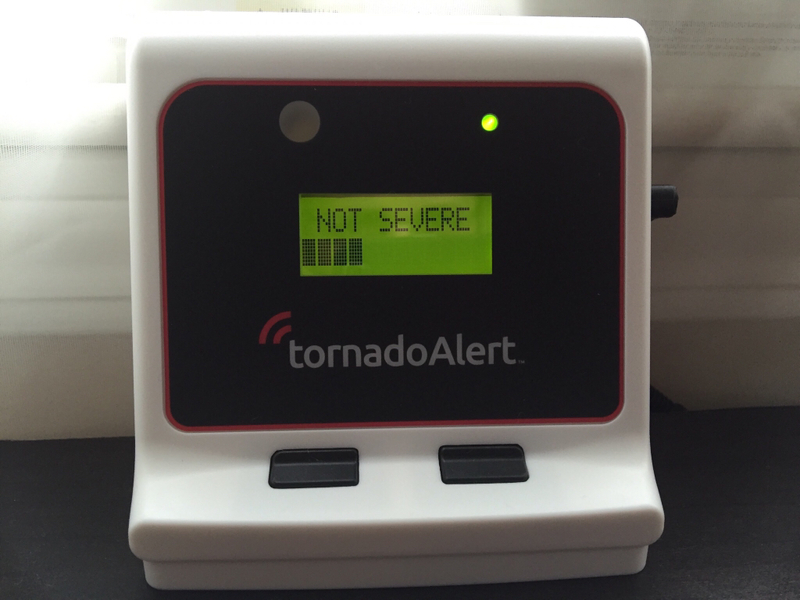 There was a tornadic storm 20 miles north of me and the device alerted me and said "Tornado Risk" 15 minutes before the NWS issued a warning. I feel like testing it directly is a pretty good way to find out if something works. There would need to be many, many more than one sample to determine accuracy vs. coincidence. Like everyone here, I am rather skeptical of this device. I would like to see this in action over several years to prove this actually works. Like ocala, I did not know that lightning was proven to cause tornadoes. To my knowledge, an increase in lightning, either in intensity or types of lightning, does NOT always precede the formation of tornadoes. I have personally seen instances of having hardly any CC/CG lightning during a tornado to where one could read a newspaper outside at night because of the tremendous amount of CC/CG lightning before and during a tornadic event. Most recent instance of this happened last Friday night, March 24, 2017 around 10:30-10:35 pm CDT. A upper end EF-1 tornado passed within 100 yards of my house to my SE. There was some CC/CG lightning with this, but not a lot. There was a Severe Thunderstorm Warning in effect at the time. The tornado was 200 yards wide, traveled 2 miles, and was on the ground for 4 minutes. We had no warning in terms of lead time prior to the tornado. This circulation showed up on 1 radar scan, despite the radar updating every 2.2 minutes. In short, this device would have NOT made any difference in terms of advance warning. If one had $70 to waste, I would buy one and take it apart and see what's inside. Finding a AS3595 lightning detector or its equivalent inside the device would not surprise me, given their low cost. Edit: Here is a link for the storm chaser communities' reaction (Mostly about like ours here), but there is a post by Lanny Dean about 3/4 the way down explaining the nuts and bolts of this thing. Interesting read on his post. There are many tools in the market that inform us about the incoming tornadoes and lightning. But some tools provide better and on time notifications as compared to other tools. Ok. I'm curious. One of these has been ordered. Will be opened upon arrival, photographed, and it's secrets displayed to all. The NWS has a little "fog stream vortex tornado simulator" that they bring to weather interest events. This thing better alarm near that, or it's going back. Oh, wait... It's going back regardless. I have one of these units. Purchased it last summer out of curiosity. It picks up thunderstorms well, and is usually good at identifying severe storms. I did have a "tornado possible" message last year with a squall line. It was producing insane lightning which likely triggered the tornado message. I sure wouldn't use it as a primary warning device, but it's fun to watch. This is from last month. It is picking up a storm that was well below severe limits, about 20 miles away. the boltec can do that a bit, i,e its a like a noise (if you look at the actual wave forms etc) ? I am a bit skeptical about this. I cannot test this myself, tornados in my country are extremely rare and only very small and I have never seen one myself, however given what I know about them and how they form, it is extremely difficult to predict it, to predict if it will touch down. There are some signs which can suggest there was one based on a radar image (hook echoes) retrospectivelly. However in this case I rather think this device will predict maybe some storm activity in general rather than risk of a tornado. Our technology today makes it relatively difficult to even detect an already existing one from a radar image without direct observation reports and so forecasting a formation of one is IMHO just impossible today, all you can do is say it is probable based on a storm activity nearby. I have owned one of these since October of 2016. I use it as a another way to keep updated when at home. I do not depend on it. Nothing beats a weather radio in my eyes and is what I depend on primarily. But it is a neat thing to have in case. If the technology could be confirmed as generally reliable, it might be interesting to be networked and enable to create screen pops on computers and connected TVs that would pull up some sort of radar screen. I'd like to see that anyways for homes with multiple devices. The only program I'm aware of that even comes close as far as notifications is WXMsg. I think that all these technologies do not work, my friend tested several such devices and not one did not even show it right! Why are you so sure of your own? <chuckle> If lightning is a tornado-indicator then last night we must of been in the movie "Twister" and didn't know it. Last night was one of the most intense lightning storms that I've witnessed in quiet some time. Lot's of cloud-to-cloud, sheet, cloud-ground, etc.,. I'm stupid, I had to walk out in the side-yard and watch...started raining so had to move to the front porch. Very intense, continuous lightning for probably 30-45 minutes. I don't think there ever was a tornado-watch, just a severe t-storm warning (which is usually understood to be a possible tornado producer, but...). Anyhow, I wonder what that gadget would have said last night. 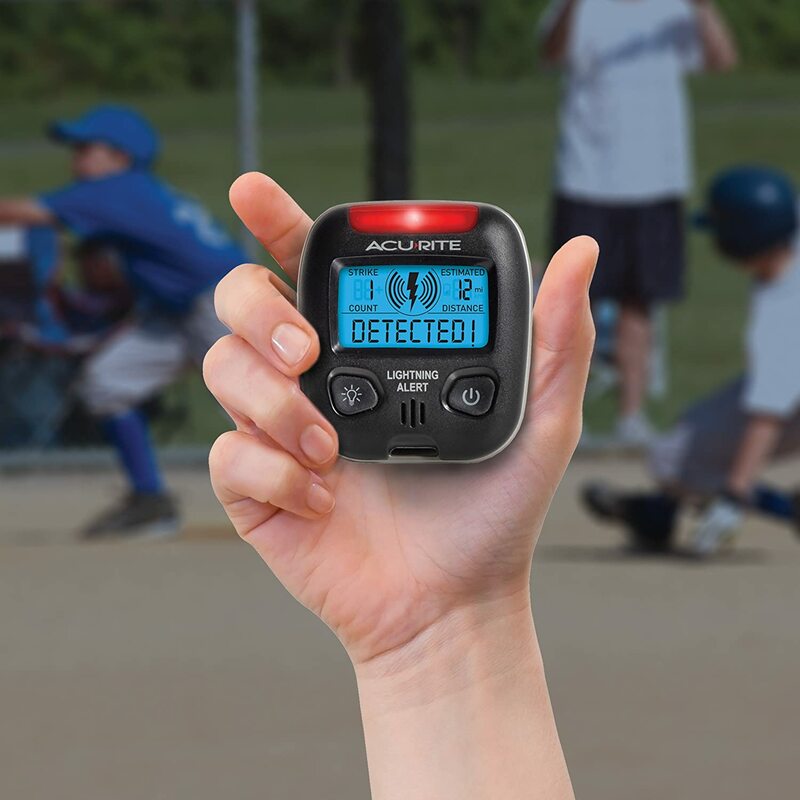 This revived thread did make me check out the gadget online and in doing so I found the "AcuRite 02020 Portable Lightning Detector"...$25 and free shipping with Amazon Prime. Just a handheld gadget, but would be interesting to see if the data could be tapped into. I read a few reviews and it seems most folks give it an "ok" review for what it is....4-star rating. FWIW. EDIT EDIT: Ok, I see that this gadget has been covered on the forum...flip a coin. ^^^ 60s sometime while watching a black and white TV, there was a scene with a tow truck with the overhead lights flashing. At one point I was absolutely convinced I saw the lights flash yellow. It had to be some kind of illusion, maybe the way the room lights caught the glass of the TV screen at that point or something, but it sure was convincing. Page created in 0.172 seconds with 49 queries.